Tell us a little about yourself and your blog! Hi everyone! I’m Ashlea – an excitable Australian who loves photography and exploring the world. I grew up in Hobart, and have also spent time living in Newcastle, Sydney (my current home! ), and New York City. I started my blog, A Globe Well Travelled, in 2014 so that I could share my knowledge and stories, while encouraging people to live an adventurous lifestyle. On top of covering a variety of destinations, I also write about travel photography, finding travel jobs, taking ethical/sustainable trips, and using minimalism to travel more often. How would you describe your travel style? Are you all about luxury or do you prefer the simpler things in life? I definitely prefer the simple things! As a minimalist, I try not to indulge in anything that could be considered an unnecessary expense. I understand the appeal of luxury travel (and there’s the odd occasion where I’ll splash out on an amazing experience) but I generally keep things fairly basic so that I can stretch my money further and take longer trips. What do you look for in a holiday destination? Is there a personal criteria that you run through before booking? My holiday destinations don’t follow any particular trip style – they’ve varied from a winter backpacking trip through the frozen streets of Moscow to a summer road trip driving through the remote deserts of southwest USA. I tend to pick destinations based on the unique experiences that I can have in each place, and there’s often a secondary reason for visiting, such as friends being in the area or an event that’s happening, like conferences or weddings. My recent trip to Europe was planned as my husband was due to attend a work meetup in Brighton, so we decided to take advantage of the situation. I flew over to London to meet up with him after he’d finished with work, then we spent two weeks driving around the English countryside and through the Scottish Highlands with some friends. It was an absolute blast! How did you catch the travel bug? Was there a certain experience that got you hooked? I’ve been obsessed with travel for as long as I can remember. When I was a kid, my family would take yearly trips to destinations within Australia and I would get so incredibly excited about them. I’d make travel diaries for each trip and fill them with detailed accounts of the activities we did each day, and I kept all of our flight tickets and attraction stubs as souvenirs. My obsession grew even more when I took my first international trip to Europe in 2006. After three weeks of exploring the best of the Mediterranean, I couldn’t wait to plan my next trip abroad. Since then, I’ve travelled to 40+ countries and I’m working on seeing at least one or two new places every year. My husband and I left Australia in 2015 to spend two years living abroad in New York City. Moving overseas was far from easy and there were a few speed bumps along the way, but it was totally worth the effort. We made some great friends in the US and took advantage of so many travel opportunities while we were there. I’d honestly recommend that everyone try living abroad at least once – it’s something you’ll never forget. Absolutely. Paris has been a disappointment on both of my visits, and I was unfortunate enough to have some nasty experiences there. There is actually a thing called ‘Paris Syndrome’ where visitors have this romantic vision of the French capital which is planted in their minds from movies and media, but when they arrive they discover that it’s not all that great. Look it up – it’s totally real! On the positive side, there have been plenty of destinations where I’ve arrived with few expectations and have been blown away – Ljubljana in Slovenia, Medellin in Colombia, Garden of the Gods in Colorado… I could go on for days! There have been so many places that have pleasantly surprised me. What do you think is the hardest part of travelling? Is there one part that has been particularly challenging to you? 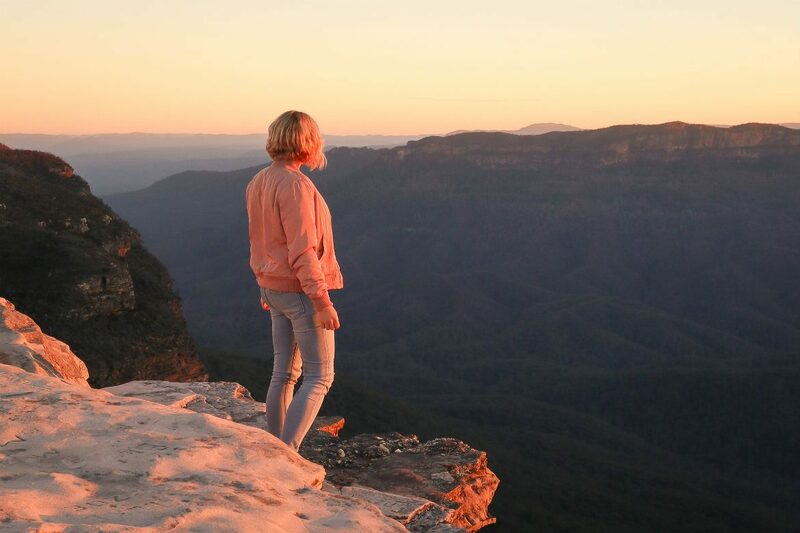 Australians tend to enjoy taking long trips, often going away for a month or more, but I have found that sometimes long-term travel can be exhausting. It’s been difficult to balance a trip with a combination of sightseeing and relaxing, as I tend to get over excited about seeing everything I possibly can and end up leaving very little time to relax. I’ve been working on slowing down the pace over my last few trips. So far, I’ve had little success! If someone was thinking of planning a holiday, which destination would you recommend and why? That depends on who’s asking! If you’re the kind of person who wants a fast-paced holiday packed with loads of destinations, then Europe is a great choice as the different countries are all close together and are easy to travel between. If you want to relax, maybe a trip to Thailand or Southeast Asia is best as you can stay in luxury resorts for cheap and spend your days chilling by the beach or pool. For something a little more adventurous, try hiking the Inca Trail in Peru or road tripping through the red desert of Monument Valley in the US. It’s your choice! If you could travel anywhere in the world with all expenses covered, where would you head? Antarctica, for sure! Tours to the southernmost continent are so expensive, and I can’t see myself affording a spot on one anytime soon. It’s high on my bucket list though, and I imagine an Antarctic adventure would be totally unforgettable. Where did you head for your last adventure? I just returned from a month in Europe where my husband and I took a road trip through the UK then went city-hopping in Portugal. The two countries were completely different; the first was rainy with lush green landscapes, and the second was sunny with bright pastel buildings. We loved both destinations and felt like we got to see so much during our time in Europe. I don’t actually have any set plans yet, though a trip to Japan might be on the cards for next year. I usually organise my trips only a few months in advance, so we’ll see what I’m inspired by when 2019 comes around! Ready to set out on your own adventure? Find flights, hotels and more with Webjet today! Feature Image Credit: A Globe Well Travelled.